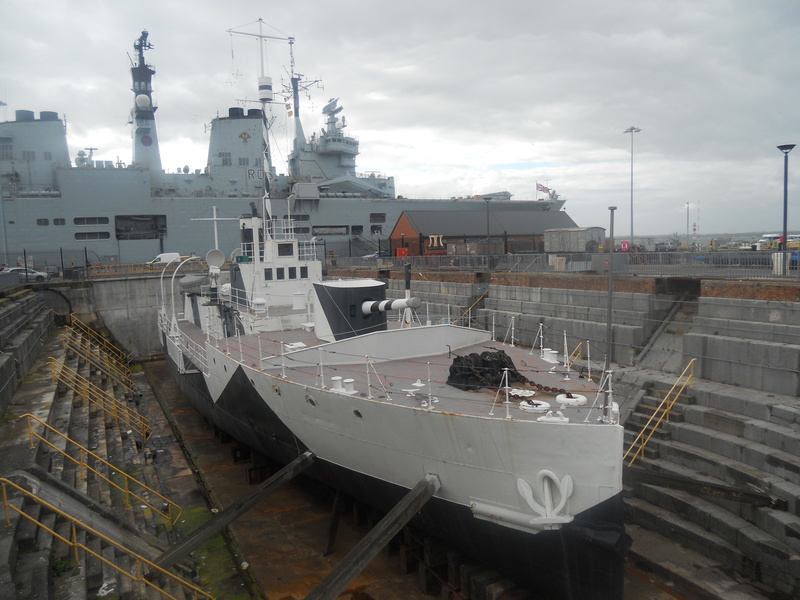 Whilst on a trip to Portsmouth Historic Dockyard (somewhere you to have visit at least once) I was taking a photo of M33, which is one of only two British warships to survive from World War 1 (with HMS Illustrious in the background), when I noticed 3 old wagons hidden in the corner of HMS Victory’s carpark. The first wagon is LSWR 5 Plank open wagons numbered 76145 in an SR brown livery with white lettering. The wooden frame wagon built at Eastleigh 1900 so for something which is 114 years old it looks to be good condition. Next we have a GER Goods Non Vent Van numbered 630569 which was built 1910 in Staford and is currently in a Grey LNER livery with white lettering. 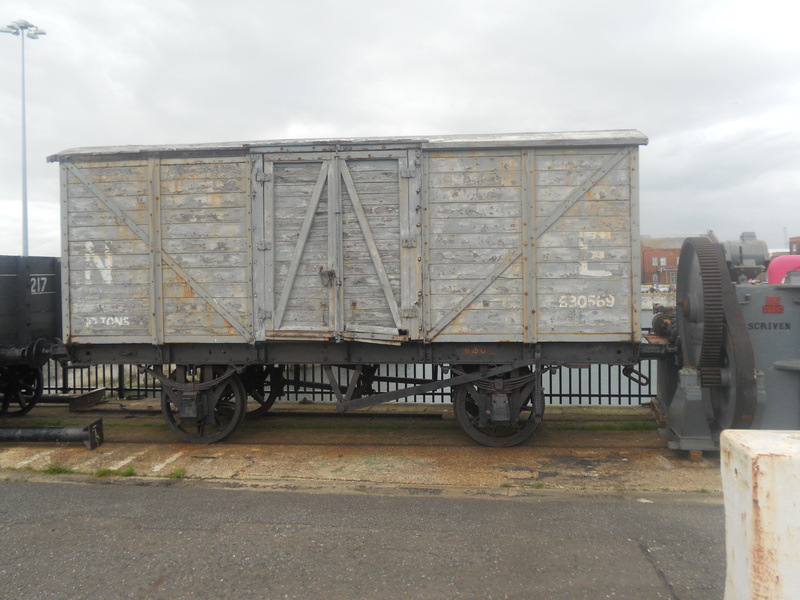 The final wagon is a bit of a mystery it looks like a cut down 5 plank open, with ends in situ but sides removed, labelled “SN50 For internal use only 8T” in a dark grey livery with white lettering. 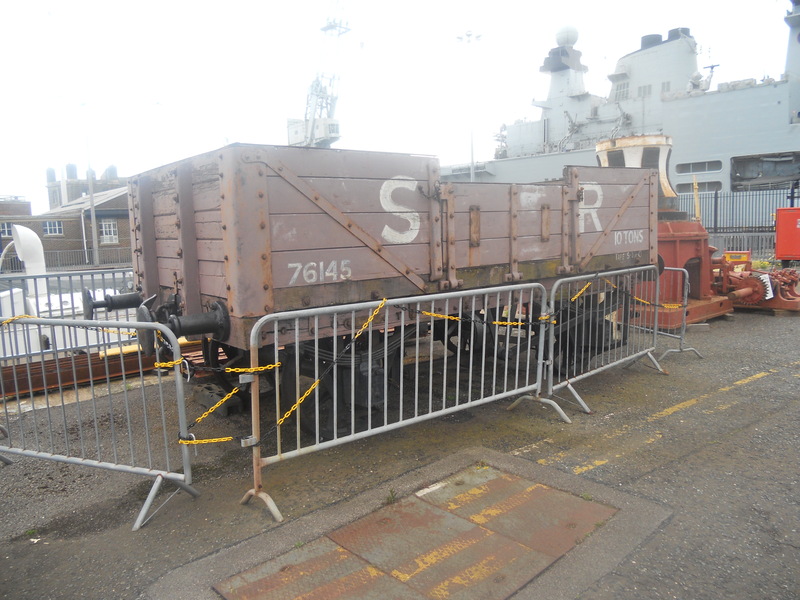 The overall condition of the wagons are not brilliant, I saw a couple of photos of them from 2009 and they need a bit of TLC since then. As a child I remember them living outside the “Museum of the Royal Navy” so it would be nice if they were given a bit of paint and put somewhere where they people could appreciate them. 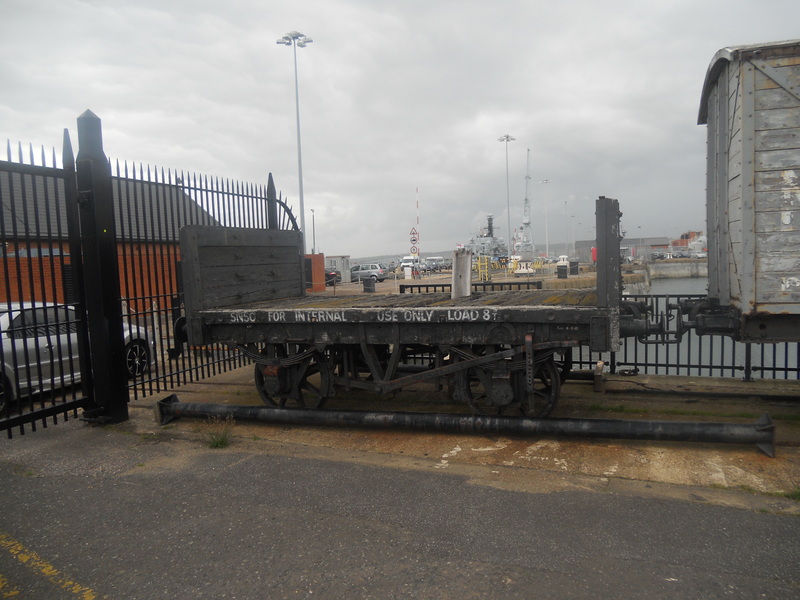 The dockyard used to have a huge internal network with a stretch of track called the “Admiralty line” which connected the dockyard to the mainline just past Portsmouth and Southsea station. 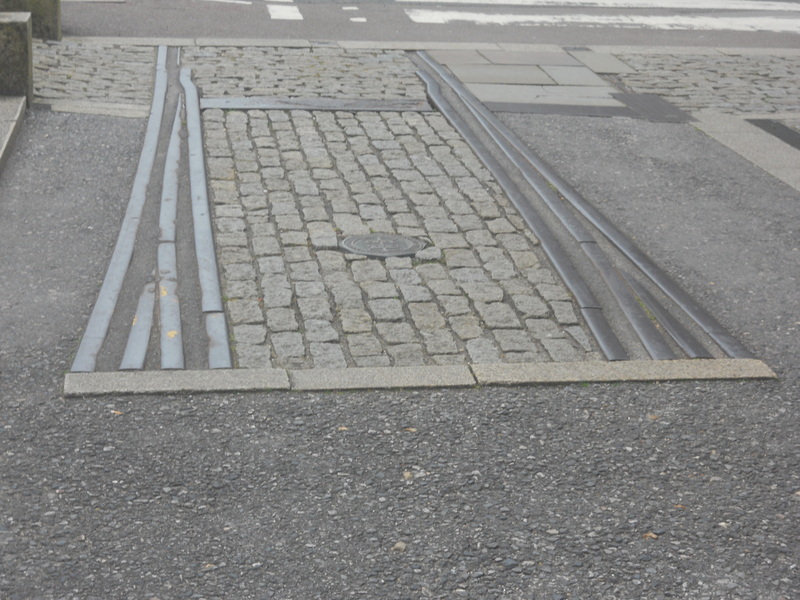 A few sections of track still exist but the gap between the rails have been filled so nothing can ever roll on them again. 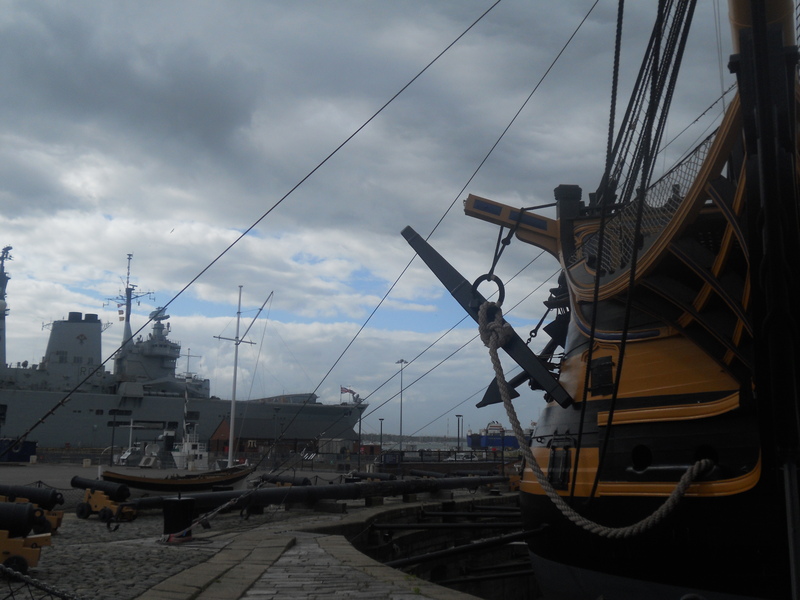 The dockyard is a very interesting place to visit and I would highly recommend a visit. In my view it is the top heritage attraction on the south coast and is a brilliant way to spend a day, the little railway items dotted around is a nice bonus for us railway enthusiasts. Like I said the wagons are hidden but if you know where you are looking, you can find them! I agree – I’ll have to find these wagons next time I visit!